The 1982 Caesars Palace Grand Prix was a Formula One motor race held on September 25, 1982 in Las Vegas, Nevada. It was the sixteenth and final race of the 1982 FIA Formula One World Championship, and the second and last F1 race to be held in Las Vegas. The 75-lap race was won by Michele Alboreto, driving a Tyrrell-Ford. Alboreto scored Tyrrell's first victory since the 1978 Monaco Grand Prix, becoming the eleventh different winning driver of 1982 while Tyrrell became the seventh different winning constructor. John Watson finished second in a McLaren-Ford, with Eddie Cheever third in a Ligier-Matra. Keke Rosberg finished fifth in his Williams-Ford to secure the Drivers' Championship, with Ferrari taking the Constructors' Championship despite neither car finishing in the top six. This was the last F1 race for 1978 World Champion Mario Andretti. It was also the last race for the Ensign and Fittipaldi teams, the last for March until 1987, and the last for Matra as an engine supplier. For the first time since the World Championship began in 1950, a country hosted three rounds in the same season in 1982. The final race of the year, and the third in the US, would once again decide the Championship. Keke Rosberg of Williams had 42 points, to 33 for McLaren's John Watson, and needed to finish sixth or better to secure the title. Meanwhile, the race was former world champion Mario Andretti's final grand prix. The course's tight turns and short straights allowed the non-turbo cars to be more competitive than usual, with Michele Alboreto's Tyrrell and Eddie Cheever's Talbot Ligier fastest among them. The turbocharged Renaults of Alain Prost and René Arnoux took first and second positions in qualifying, more than eight-tenths clear of Alboreto. The two Championship contenders, Rosberg and Watson, meanwhile, were in sixth and ninth places respectively, separated by the Ferraris of Mario Andretti and Patrick Tambay. At the green light for the race on Saturday, Prost led from the pole, followed by teammate Arnoux. Cheever, from the fourth spot on the grid, was determined to get around the outside of Alboreto on the first left-hander. They touched wheels, but both continued with Alboreto still in front, Cheever's Ligier sporting a vibrating front wheel and the Tyrrell of Alboreto bearing a tire mark on the right sidepod. For the first ten laps, the Renaults steadily pulled away from Alboreto, with Arnoux now leading Prost. The Tyrrell began to match Arnoux's times, however, and then to close on him, as Prost took back the lead on lap 15. Speculation of a problem with Arnoux's car proved true, as the Renault was faltering, and he retired on lap 21. Watson, meanwhile, had dropped to twelfth in the opening laps, but passed Piquet on lap 12, then Rosberg, Andretti and Cheever on successive laps, eventually reaching third place, with a thirty-second gap to the two leaders. However, when Andretti, hoping to help clinch the Constructors' title for Ferrari, slid off directly in front of Rosberg on lap 27 with a broken rear suspension link, Rosberg took over the fifth place he sought. Among the leaders, Alboreto began inching closer to Prost again, and Watson continued to close on both of them. Niki Lauda's McLaren retired on lap 54, while Alboreto had eliminated the gap to Prost, and gotten by him to take the lead in a Grand Prix for the first time. Prost's tires were picking up rubber and had developed a vibration. In four more laps, Watson had also caught and passed him, but he was having the same problem as Prost, and so could make no progress on Alboreto. Alboreto cruised to a comfortable victory, his first ever and the first for Tyrrell in four years. Alboreto was the 11th different victor that year. Cheever was also able to overtake the ailing Prost for third, nine laps from the end. Less than three seconds behind Prost, and the last car on the lead lap, was Rosberg, who therefore won the title. Ferrari won the Constructors' Championship despite not finishing in the points. Rosberg and Watson both entered this race with a chance of winning the Drivers' Championship. Watson (33 points) needed to win the race, with Rosberg 7th or lower. Had this happened, both drivers would have finished with 42 points, and Watson would have been champion by virtue of having three wins to Rosberg's one. For the first time since 1964, three teams entered the final race with a chance of winning the Constructors' Championship. Renault (59 points) needed 1st and 2nd, with the Ferraris 7th or lower. Had this happened, both teams would have finished with 74 points, with Renault then winning by virtue of having five wins to Ferrari's three. ^ "Weather information for the "1982 Caesars Palace Grand Prix"". The Old Farmers' Almanac. Retrieved November 22, 2013. ^ "1982 Las Vegas Grand Prix". formula1.com. Archived from the original on 19 February 2014. Retrieved 23 December 2015. ^ a b "Las Vegas 1982 - Championship • STATS F1". www.statsf1.com. Retrieved 14 March 2019. Rob Walker (January, 1983). "2nd Las Vegas Grand Prix: King Keke". 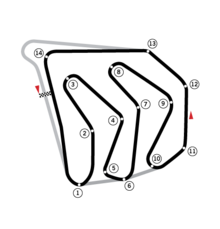 Road & Track, 96–99.